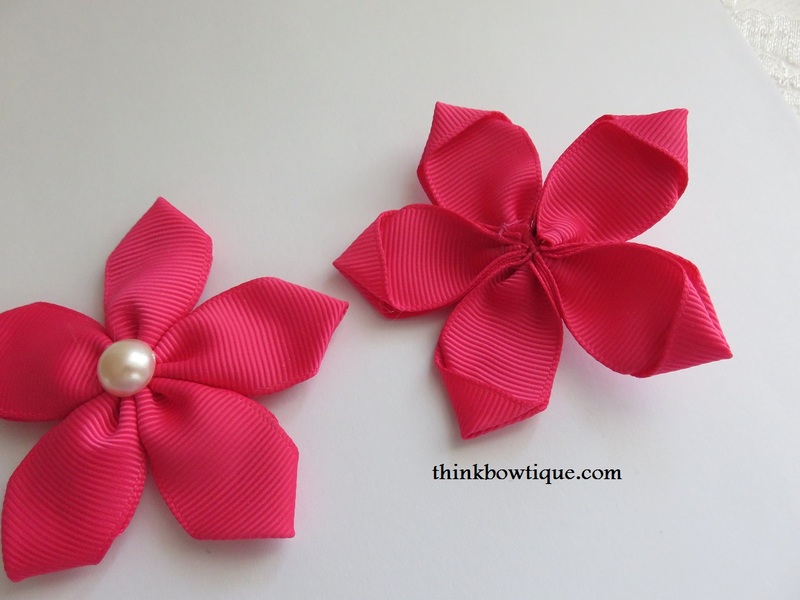 Home » How to make » How to make a 5 petal flower with ribbon » How to make 5 petal flower with Grosgrain ribbon. 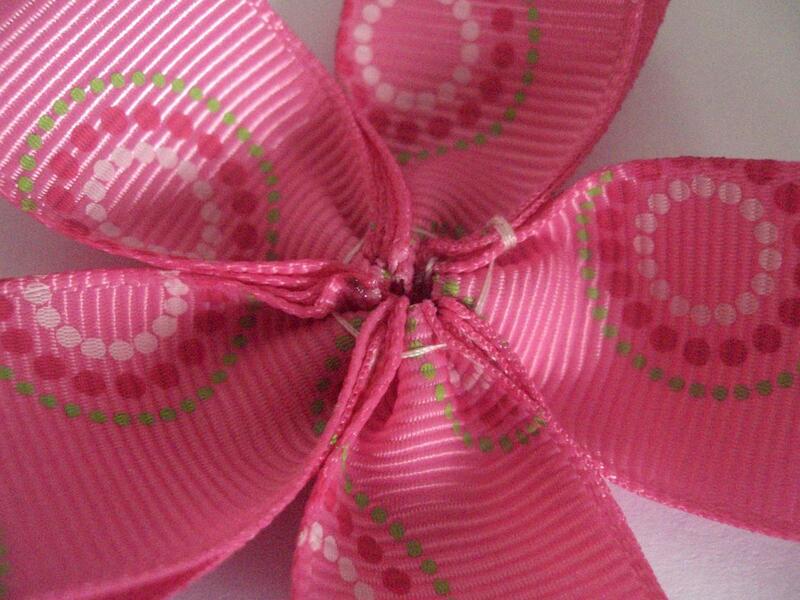 To Make this 5 petal flower you will need 5 by 3″ lenghts of 22mm grosgrain ribbon or double sided satin ribbon. You can use different lengths for a different look or add more petals. 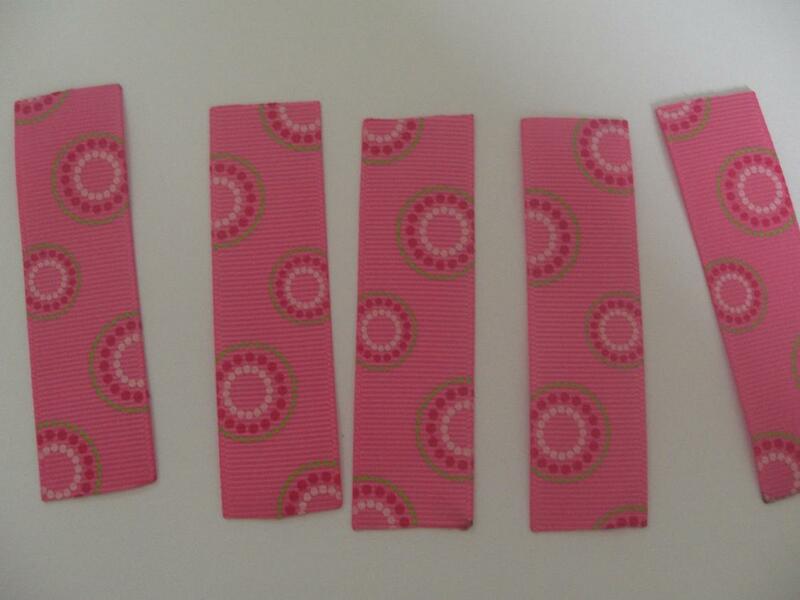 Fold 1 length of grosgrain ribbon in half and stitch the cut edge as per picture with two hills and one valley. Continue with the next length. 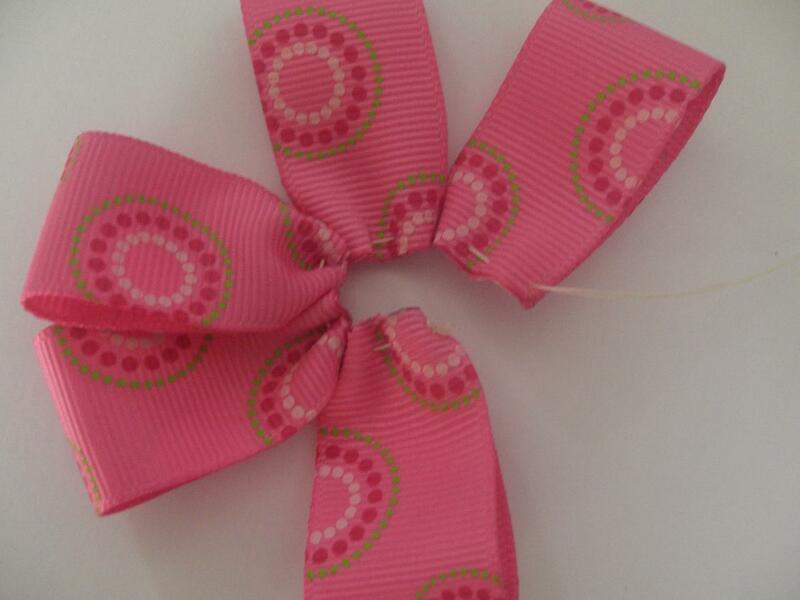 Make sure your grosgrain ribbon sides face down. Continue until you have 5 petals. Join the first and last petal by stitching through the front of the first petal and pull tight. I like to do another layer of stitches around the back. Stitching through only the sides of each petal and pull tight again and double knot. This is the back view of the flower. If you would like flowers with pointy tips. 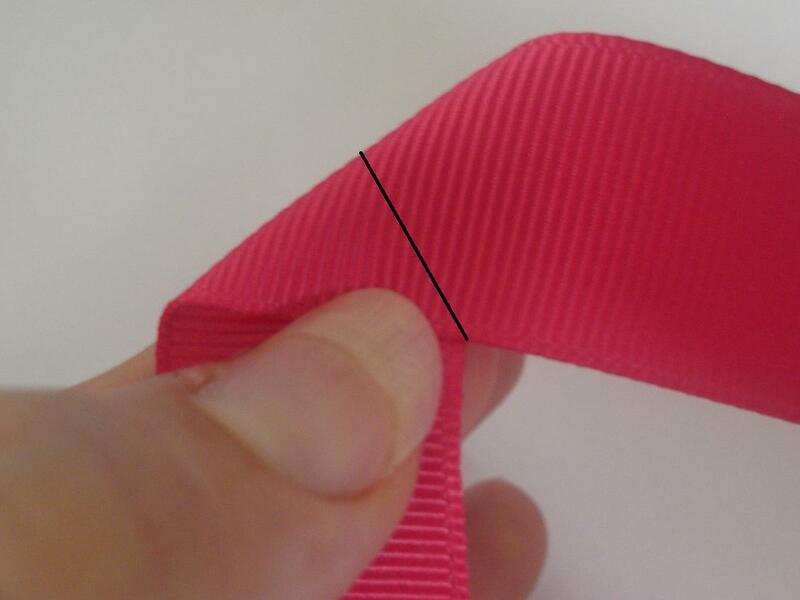 Take you 3″ length of ribbon and fold to make a right angle. Now you fold the grosgrain ribbon on line in the last picture so the ribbon on the right is now sitting on the ribbon I was holding with my thumb. 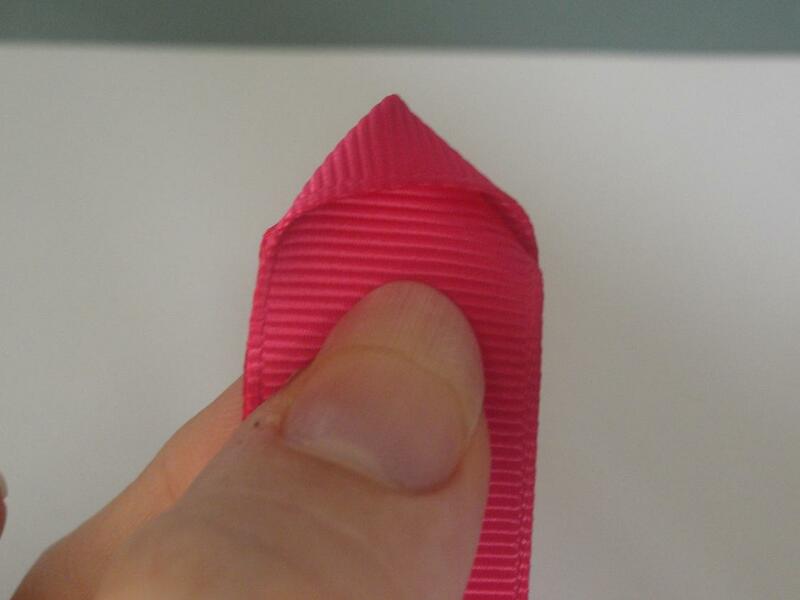 I place a dab of hot glue on the inside corner of the grosgrain ribbon to hold it together and than you stitch the base of the petal the same as above. 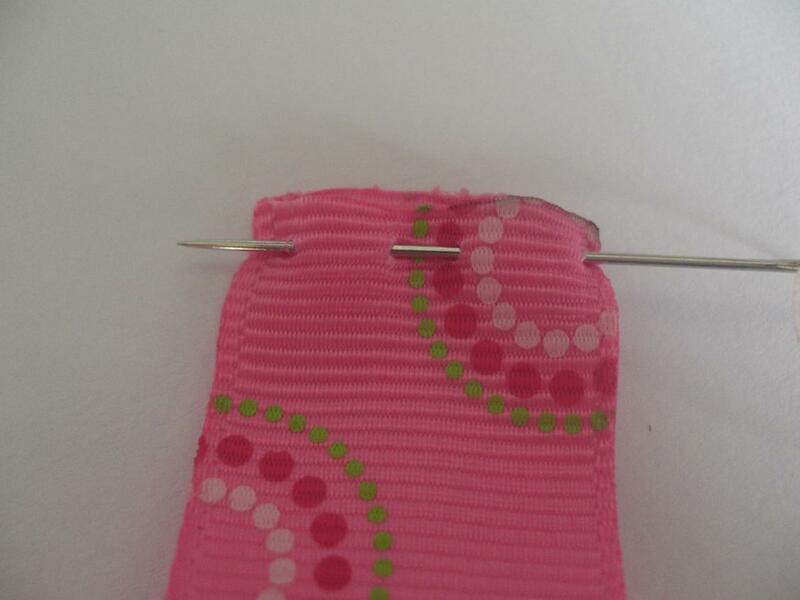 Or you can just fold over and press the petals in place and the stitch as per the flower above. 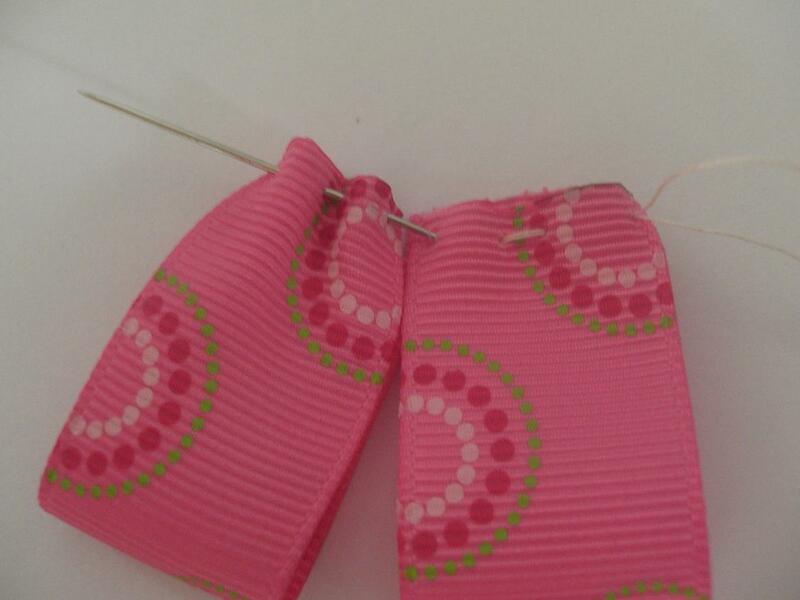 For the satin ribbon flowers I just fold and stitch. 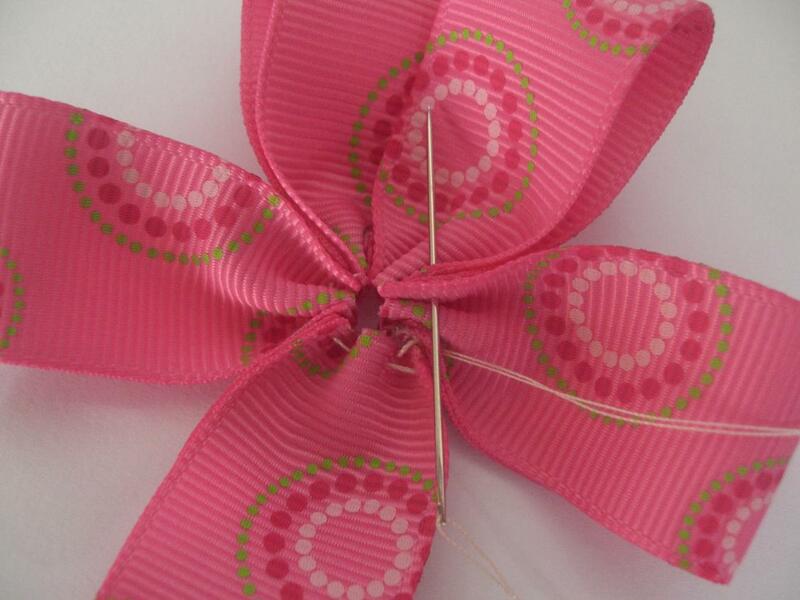 I hope you find this grosgrain ribbon petal flower tutorial helpful and if you would like to share please leave a link to our page. 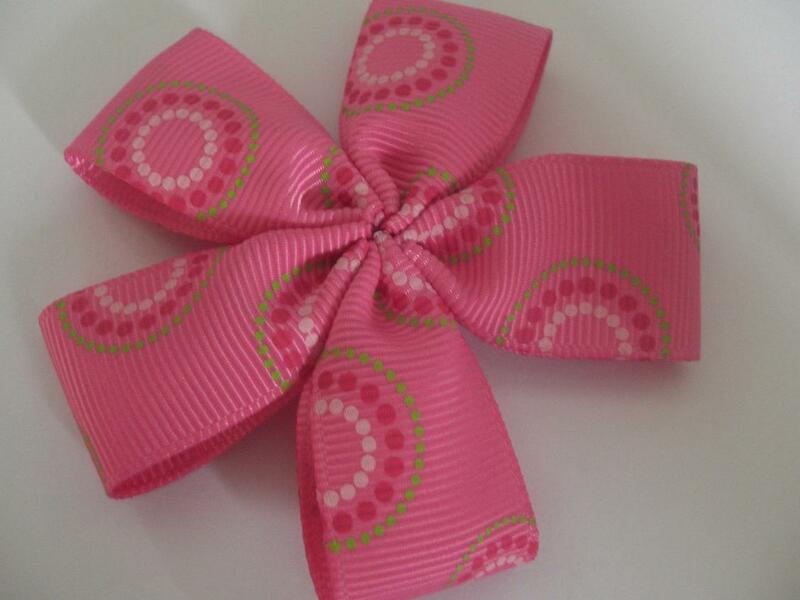 At Think Bowtique we sell the finest quality grosgrain ribbons and double sided satin ribbon available. 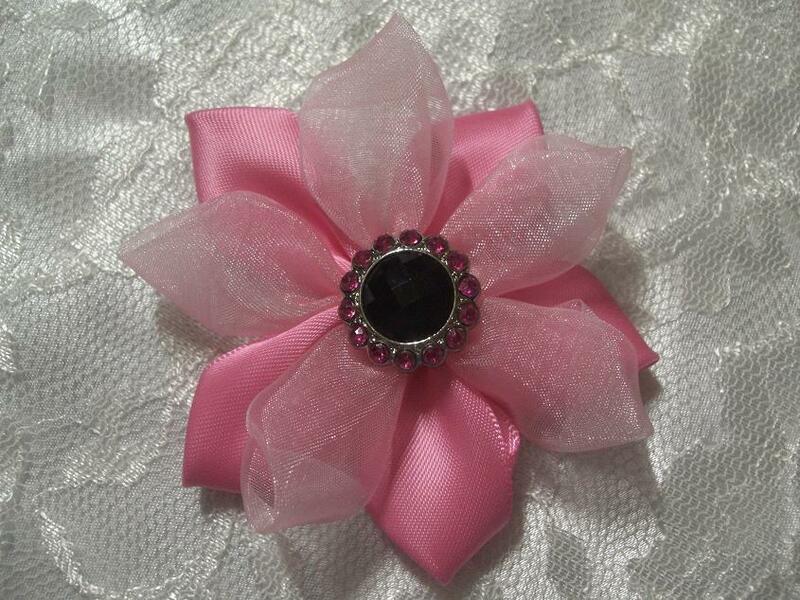 You will also find a huge range of rhinestone embellishments for your flower centre. 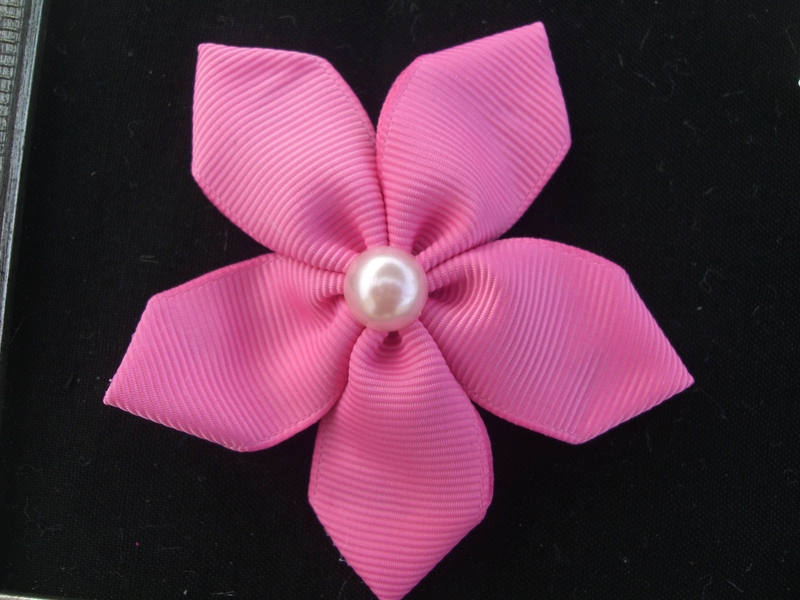 If you would like to turn your ribbon flower into a hair clip or headband we have hair clips and a huge range of headband elastic’s. This is a really sweet flower. I can just imagine a girls bodice covered with these in a rainbow of colours.